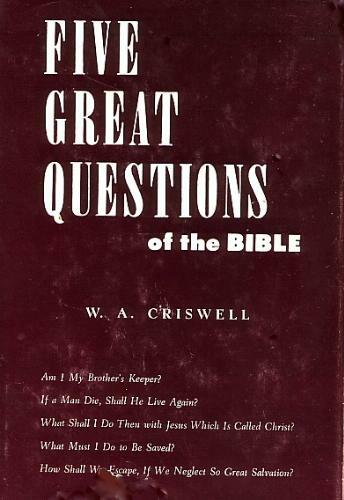 Dr. Criswell answers some gripping questions from the Bible from the Word of God itself. In a series of graphic illustrations from both the Old and New Testaments, the author gives God's answer to these questions from His Word. These studies pick out important parts of the bible, from the Genesis, to the last book, Revelation. Each study has notes helping you understand the context and the unusual words. By the end you'll have a good idea of what the bible is all about. A brief study guide to the principle construction, themes and topics of the biblical story. Covers both Old and New Testaments. Suitable for group or individual study. A recommended introduction and prerequisite to other comprehensive study guides. The Trinity is the heart of the Christian gospel, but Father, Son, and Holy Spirit seldom occupies that position in contemporary discussions of the Christian worldview. This book helps fill the need by unveiling the Trinity at the center of reality. With our American Philosophy and Religion series, Applewood reissues many primary sources published throughout American history. Through these books, scholars and students can see the thoughts and beliefs of Americans who came before us.